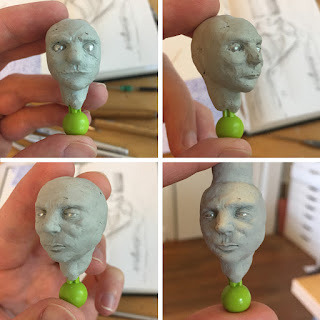 Here are some process photos of a head I was working on last week. 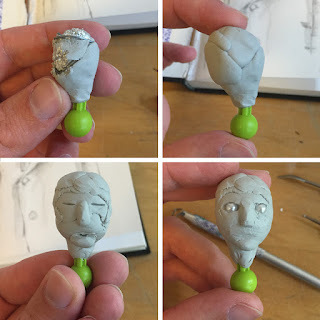 I plan on casting this, which I haven't done for a long time. I'm having to learn the process all over again. Luckily, it's a pretty simple shape. I am using a K'NEX piece that I cut down for a ball and socket joint. It starts with wire and foil to fill it out before the Super Sculpey is added. The eyes are just plastic beads. The odd hairstyle is just an extra piece for the casting process and won't be visible in the final.